Exposing property features is as easy as entering an address and choosing the details you want to review - from basic wetlands to complex rare species habitat. Compare the time and effort here to the drudgery of a manual search, compilation, and overlay creation of alternatives. LandCert offers full-color, professional reports encompassing the highest level of professional presentation for your clients or your own records. The information and data is current, and complete. LandCert also provides consulting and advisory services to support the research and reporting provided. Researching Land has never been this easy with our centralized resource with access to deeds, conservation rules, environmental assessment, and rare species habitat. 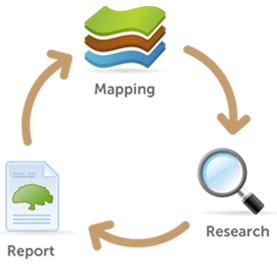 LandCert provides a comprehensive directory of resources to research regulatory, historical, and current features impacting property and land resources.